Welcome to the 492nd Metamorphosis Monday! Happy Monday! It’s the start of a brand new week, looking forward to sharing it with you! 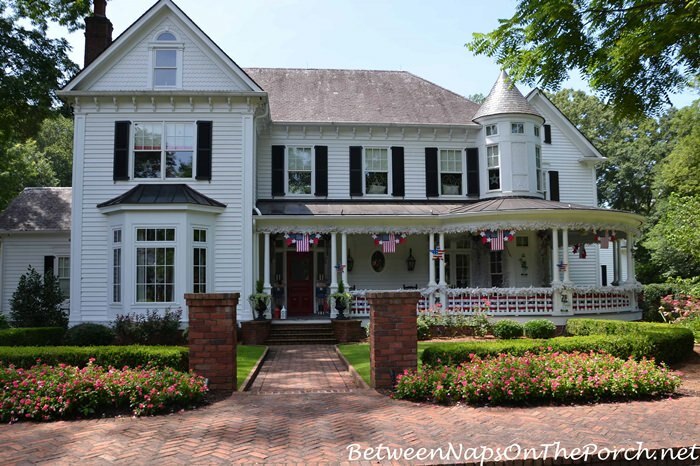 On Saturday I shared a few photos of how Marie’s beautiful Victorian home is decorated in celebration of this year’s Independence Day. Let’s go in and see how she decorated inside! The family room was very festive! I bet the mantle is so pretty at night with the lit garland! 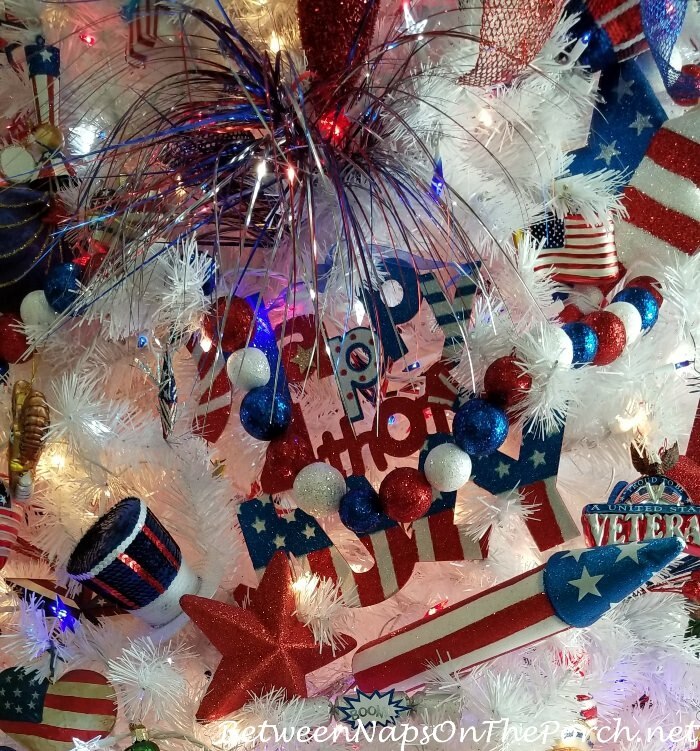 Marie said she leaves her 4th of July decorations up all summer until it’s time to decorate the tree for Halloween. 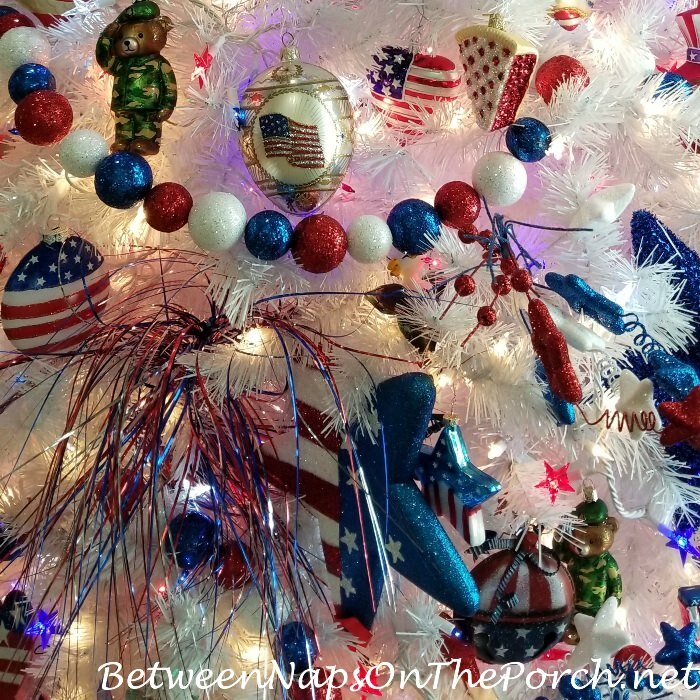 Here are a few close-up pictures of the ornaments on this Independence Day tree. One tip Marie shared, in case you are thinking of putting up a white tree to decorate throughout the year: Marie cautioned against storing a white tree in attics or any place that gets really hot. She said that it will cause them to turn yellow. She’s even seen that happen when a tree is near a window where the hot sun beats down on it. So probably best to place a white tree where it doesn’t get a lot of sun, especially the late afternoon sun. 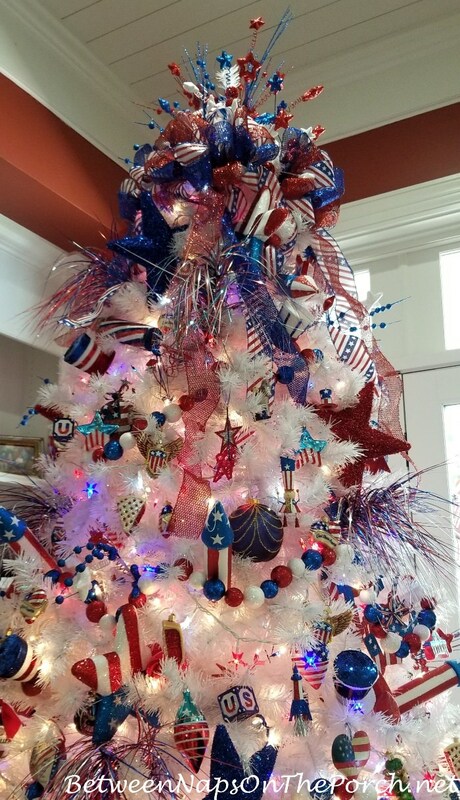 Love the topper on this grand 4th of July tree! Looks like an explosion of fireworks! 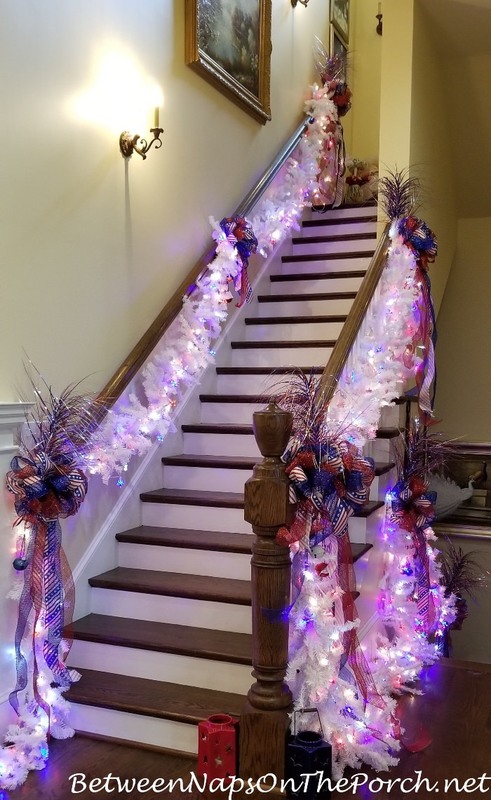 Marie also decorated her main staircase for the 4th. Marie always creates a fabulous centerpiece for her large kitchen island. I love these giant firecrackers! She just ordered some new wine glasses and unboxed some of those during my visit. You can see one in the photo below. I don’t think she’ll use them in this year’s tables, though. The tables were already set and ready for upcoming parties. I’m looking forward to sharing those with you this Thursday for Tablescape Thursday! If you would like to see more of Marie’s home, including her wonderful kitchen, check out this previous post: Tour a Beautiful Victorian Home Decorated for Christmas. At the end of that post, you’ll find links to post/tours of other rooms in her beautiful Victorian home. Thanks so much to Marie for opening her home to us and to so many others throughout the year! Her creativity and love of life really comes through in all that she does! Such a joy to see! I post regularly on Instagram. Follow Between Naps on the Porch on Instagram here: Between Naps On The Porch. If you enjoyed this post, subscribe for free email updates when a new post is up here: Subscribe for post updates. 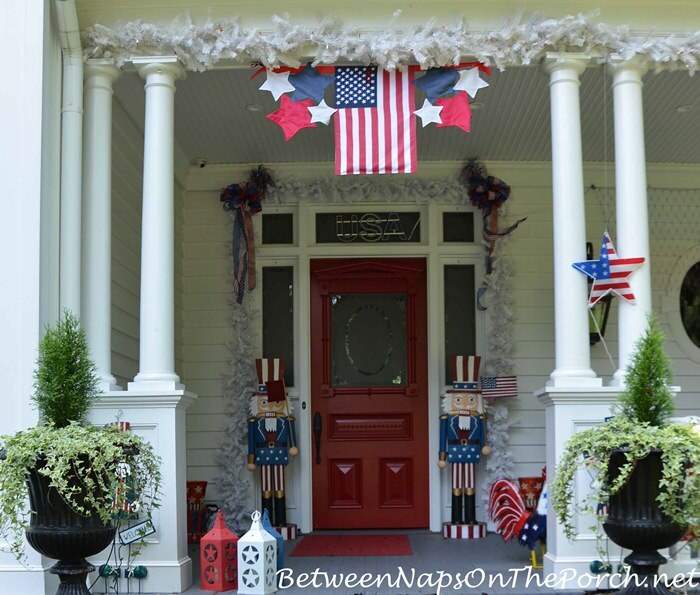 Previous PostDecorate a Porch for the 4th of July! 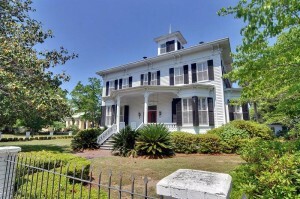 Thanks for sharing Marie’s beautiful Victorian home! 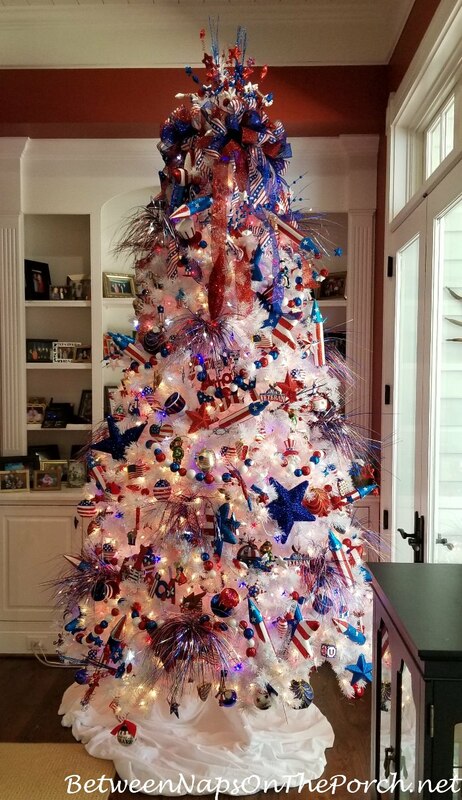 Her patriotic tree and decor are amazing! Happy Independence Day, Susan! Marie is something! 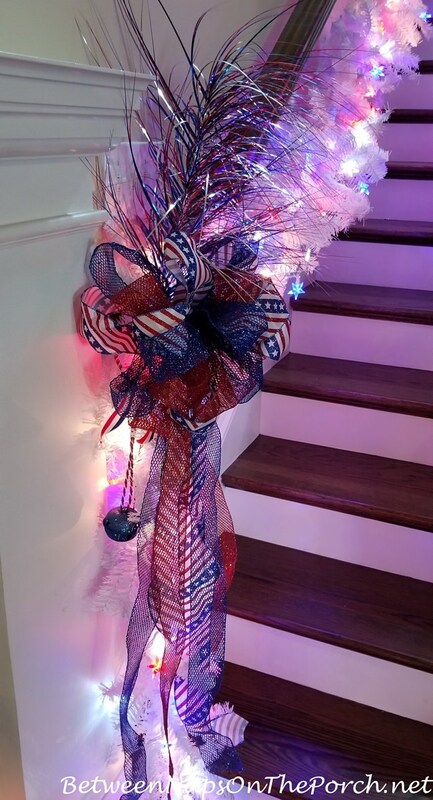 Beautiful decor for July 4th! I need some of her energy. 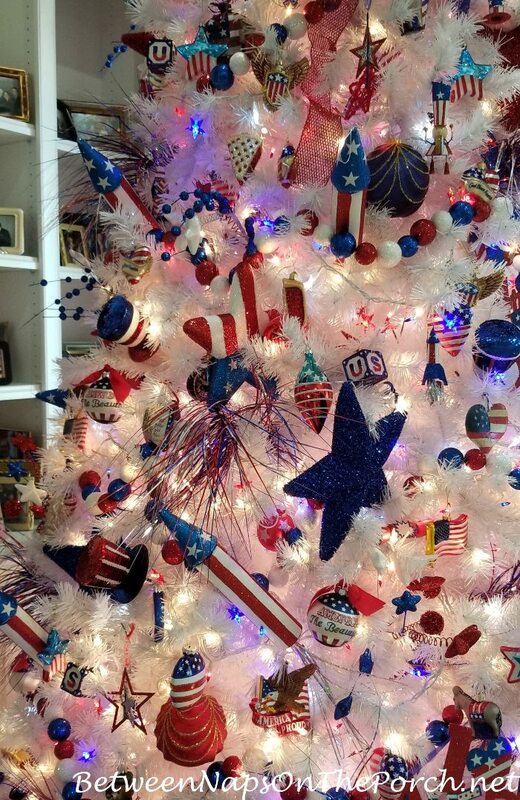 I would have scoffed at a July 4th tree, but Marie really makes it so festive and beautiful. Great idea! It could also be set up for Memorial Day and left up for Flag Day and then into the 4th. Marie has a beautiful home and decorates it so wonderfully. I really enjoy seeing her decorations, thank you for showing us all her beautiful things. Have a wonderful 4th of July in Georgia. Thanks Susan. Thanks, Peggy! Happy Independence Day to you! Love that! Happy Independence Day, Cyndi! 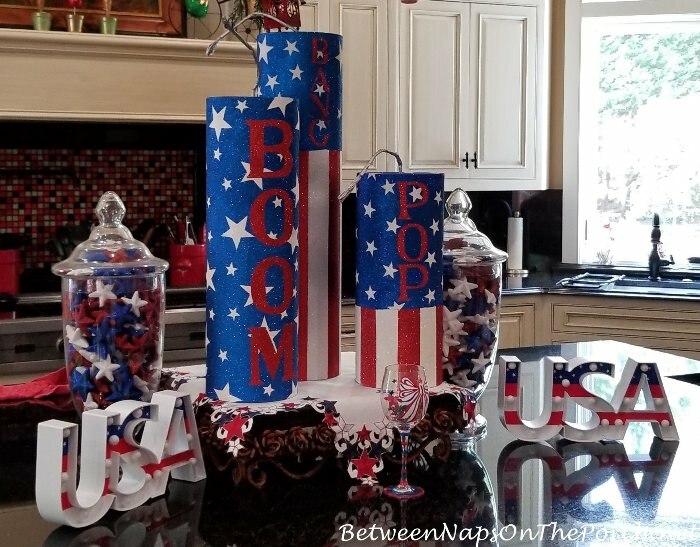 I am always amazed at Marie’s decorating skills for every major holiday, and the Fourth of July is no exception! But where does she find all her themed ornaments? She must be always looking for new ornaments throughout the year that will go with a particular holiday. I know at Christmas you can find some that would work for the fourth, but have never seen that much this time of year. What a way to add sparkle to her home, no wonder she leaves it up until fall! Thank you for putting these pictures up! Barb, I find a lot of decorations at pier one and a place called Tuesday morning as well as Hobby Lobby. There are several online stores like Christmas lights etc. and treetopia that have patriotic decorations including eBay and Amazon. You can also order from pier one. Than you Marie for the answer. I have a small white tree I put up for Valentines Day, Saint Patrick’s, Easter and Halloween and decorate it accordingly, but never over summer for the Fourth. You have beautiful ornaments on the tree! I have bought some Halloween ones at Pier one. You must get people stopping in front of your house all the time just to admire it, and I’m sure many look forward to the next holiday just to see it. 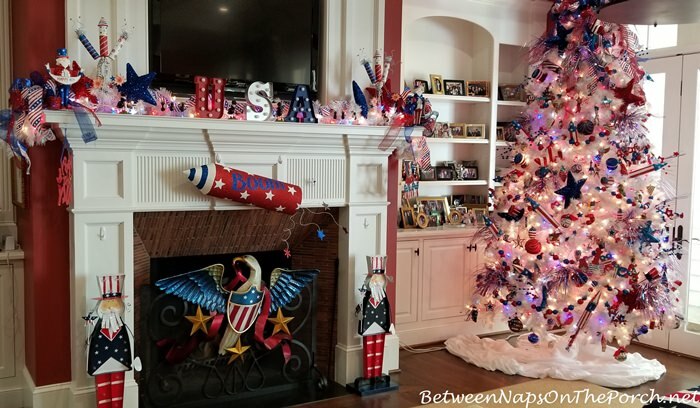 Love posts of her beautiful home and festive decorations. Such a joyful home! Yes! Definitely feels that way when you’re there. Happy 4th of July, Mandy! I so love seeing Marie’s home decorated for every Holiday!! Thanks so much for sharing it with us again!! Beautiful!! Thanks too for hosting each week!!! Have a wonderful 4th, Debbie! Someday I hope you’ll share Marie’s storage. Her decorations are fabulous, yet it just blows my mind as to the amount of storage it must require for all her holidays! Hope your 4th celebration exhibits your freedom of choice, whether you choose a small or large gathering, or no gathering at all! Thanks, always, for inviting us in to share with each other. She has a very large basement and that’s where she stores the majority of all her decorations. She’s super organized so she knows where everything is. I’ve only been down to her storage area once…and that was when I shared on the blog her candle storage. It was pretty cool the way she was storing those. I’ll see if I can find that old post for you. Hi Susan! Thank you so much for hosting your party for us AND for sharing Marie’s stunning decorations. I am SO glad to hear that she keeps the decorations up all Summer…that is a lot of decorating to do for just a month or so. Marie’s home is always amazing! Thank you for showing it to us. Susan, thanks for sharing Marie’s gorgeous home. You can really tell she loves any opportunity to celebrate and make fun times for family and friends. Hope your 4th. is a good one. We watched Longwood Gardens fireworks last night and they were especially good, with some new ones we hadn’t seen before. Hugs! Oh, I bet those were wonderful! Happy Independence Day, Bobbi! Marie’s tip regarding white trees turning color due to heat is very enlightening. I had a white Christmas tree that I loved but it turned yellow/brown and I couldn’t figure out why. I kept it stored in the rafters of the garage so I bet it was due to the heat. Thanks for the tip. I was hoping to get another; if I do, I’ll store it somewhere else. Oh, I bet it was the heat. I never knew that about white trees either. Makes me wonder now if green trees change color when stores in hot places, only maybe we don’t notice it as much since they are green and not white. It must be truly delightful to have Marie as a friend. Her decorating is so cheerful. On a different subject, I owe you a huge and well-rested thanks. Yesterday I got tired of struggling with my pricey memory foam pillows which gave me nothing but bad memories. I looked up your old post on bed pillows, drove off to the nearest Dollar General store, and plunked down $4 for two awesome pillows. (The website said they were $2.50 but they were $2 at the store.) Last night I slept better than I had in months! Spread the word -/ these pillows are great! That’s awesome! That’s where I’m still buying mine. I notice they get a little too flat after about 6 months, so I usually buy another one around then. So for $4 a year, I’m sleeping a whole lot better. 🙂 So glad it worked for you too, Brenda! Amazing the difference a pillow can make, isn’t it! I must sound like a broken record but Marie is amazing!!! I can’t believe all she does, and does it all to perfection! Thanks so much for sharing this!!!! OMGoodness, just realized my info is filled in!!! Whoo hoo!!!! Marie does a fabulous job! OMG! This is like C’mas only in Red, White and Blue ! I wonder if I really would love to transform my house at every chance, therefore I admire your friend Marie… amazing ! Well she really brings forth a festive spirit! My mom had a couple of white Christmas trees and they yellowed. They got stored in the garage when not in use and I think the heat got to them. I love that stemware she got- I was going to order them from Pier 1 since they aren’t available at the stores. Wishing you a Happy 4th! I think that’s where Marie ordered her glasses, too. Happy Independence Day, Liz! Susan and Marie, I always enjoy your wonderful photos of your outstanding homes. This morning I really needed a shot of inspiration. My husband and I are trying to do some painting and general sprucing up of our 1886 Italianate/Victorian. Our house is located, as Hoosiers would say, “right smack” in the downtown area of our small mid-western city. Living in spotty urban areas is never easy, but I always want to take the very best care possible of our home. During the laundry/mud room painting process we discovered a roof leak. A big, big roof leak. More complex and involved than my time will allow to explain, it has proven to be discouraging! Because of the nature of the house and its age, we decided to hire a real first-class specialist to propose the needed new roof and repairs. We learned a lot! In the past nothing had been done correctly, perhaps because the workers didn’t actually know how. Now, we are in for a very, very big project to put all of the various complexities of our roof into good order. The cost will likely curtail the other indoor projects that I had looked forward to so much. We will prevail—it will just take a lot more time! 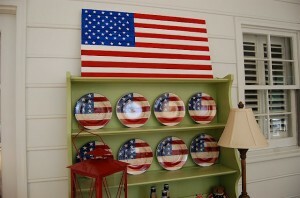 Today I am decorating for Independence Day anyway! Thanks for the very cheery, gorgeous Fourth decorations you shared and how they lifted my spirits! Thanks so much, Brenda! The fireworks were going off all around me last night here in the neighborhood. 🙂 You just had big celebrations too, right? Happy belated Canada Day!